Chef-owner Alex Seidel's Union Station restaurant and market impresses on every level. : Alex Seidel, who catapulted Fruition, his Country Club restaurant, to national recognition, is well on his way to achieving the same success with Mercantile, a market-and-restaurant concept that resides in Union Station. 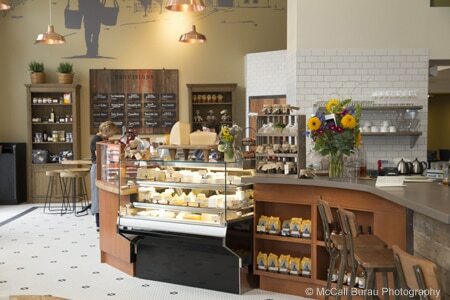 By day, the artisanal market, which also features a state-of-the-art coffee culture setup, turns out sandwiches, charcuterie and cheeses --- some of which are made at Fruition Farms, Seidel's local farm and creamery --- along with daily changing provisions, including house-made jams, butters and pickles. The market, open all day, is complemented by a large bar area, chef's counter overlooking an open kitchen and dining room, where foodniks congregate in the evening to feast on Seidel's season-intensive dinner menu. Start with the toasted farro carbonara specked with guanciale and crowned with a yolk-spilling egg, or the Canadian mussels floating in a coconut red curry. We recommend main dishes like the Spanish octopus à la plancha, pooled in a tomato-saffron broth, or the bone-in pork chop side-kicked with a grilled fig salad. A fistful of family-style plates, including a seafood, chorizo and rabbit paella served in a traditional pan, are excellent for group outings. For dessert, indulge in the chocolate pot de crème with salted cardamom caramel, chocolate sablé and vanilla Chantilly. The obsessively geeky wine list is an oenophile's dream, and cocktail and beer enthusiasts have plenty to choose from, too.